‘I Came to Live a Life Free From Surveillance’ - Integration Through Media ....! How are you finding things here? I am staying at a friend’s place in New York right now. I think it’s going to take me a while to get acclimatized. I still feel a bit disoriented. There has been a certain amount of debate online about which organizations helped you to leave China. Can you confirm which ones? The main ones were Women’s Rights Without Frontiers, Women’s Rights in China, and Anne Noonan of the Committee for U.S. International Broadcasting. You visited the United States in 1997. Twenty years later, what is the reason for your trip here this time? The first time I came to the U.S. it was just to take a look at it, because I was young, and I wanted to see what a genuinely free and democratic system was like. I stayed here for a year that time, and I got a very strong desire to see Chinese people able to live freely like Americans … so I went back to China to work for democracy. It was all a bit hurried at the time. The reason I am in the U.S. now is that I have spent the … whole of the past 20 years either being put in jail or under very close surveillance. There is no room for me to exist there, or to promote democracy. I came to see my two daughters, and to live a life that is free — free from surveillance. How long did the whole process take, getting to the U.S. this time around? It took a long time; several months. I waited for three months in Nepal this year because John Kamm of the Dui Hua Foundation, who also played a big role, had started talks with the U.S. government. The Dui Hua Foundation was also instrumental in persuading the Chinese government to give me a passport. Were you under pressure from the Chinese government before you left? Yes, the Chinese police and other security departments expended a lot of energy on me after I got out of jail the year before last. I didn’t know why they had paid such attention to me over the past 20 years, because I thought that there were far more politically sensitive dissidents than myself who were able to move freely around China’s cities and provinces. But I was detained and told to leave town wherever I went. I went to Beijing to try to find a job, and I couldn’t get a job in Shenzhen, Chengdu or Chongqing, and I was hounded from all of those places. That happened to me wherever I went in China. And the fact that I was under continuous and close surveillance all added to the pressure on me. I have been jailed five times during the past few years … The most recent time was for three-and-a-half years because of my daughter’s Anni [and the campaign for her schooling]. If the Chinese authorities want to get you, there’s nothing you can do about it. They can detain you whenever they want on any pretext and send you to jail. The charges against me were ridiculous. What was life like in prison? Over the past few years in jail I was able to protect my health and not suffer too much damage inside. I didn’t go on regular hunger strikes as I did in the past, nor did I try to fight the system. But I still got a lot of health problems, and I have mostly been trying to take care of my health in the past couple of years. Also after I got out, I kept a low profile, because I wanted to get a passport and leave. When you were released from re-education through labor in 2001, you published a book entitled Sorrowful Soul, which described all the difficulties and struggles you have had over the years. It seems that your troubles have continued since then. Is yours still a sorrowful soul? Yes. I’d even say that I’m even sadder and more despairing than I was back then, because then I was still full of passionate hope for China, that it might develop in a healthier, democratic direction. But 20 years of persecution and struggle have left me feeling that there is no hope for China; that everything there is getting worse and worse. Politically, I think we are seeing a turn to the left, and nobody knows what direction we are going in right now … They have polluted the environment to the point where it can barely support human life any more. Three of my relatives were diagnosed with terminal diseases in the space of a month; this is the result of the serious pollution. The level of environmental pollution in China is terrifying right now. Can you give us a description of civil rights activism in China? Things are getting more and more difficult for anyone trying to defend their rights. Recently Sui Muqing, an extremely ethical and professional lawyer, had his license to practice revoked. Then there was the persecution meted out to lawyers in large numbers since July 2015. We still don’t know what happened to lawyer Wang Quanzhang to this day. Many other rights activists have been subjected to worse persecution. There is less and less space for rights work in today’s China. How are your two daughters? They’re doing really well. I am very, very happy with the way they both turned out. They are both Christians now, and they’ve been very well raised. I have seen a lot of their photos, and you can tell from the expressions in their eyes in those photographs that they are happy, which pleases me greatly. 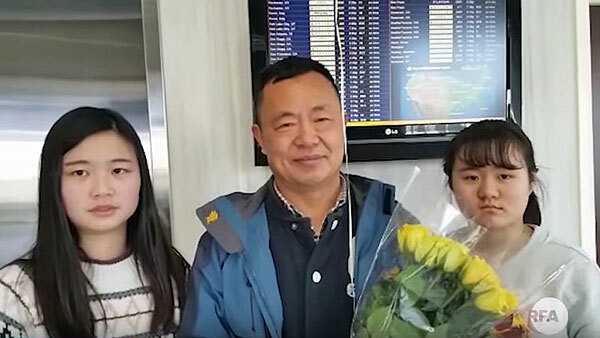 Both of my daughters are also full of self-confidence, and they are very articulate, which tells me that they have been doing really well during the past four years in the U.S.
What are your plans now that you are here in the U.S.? Will you ever go back to China? I have no plans to go back for the time being. I had actually planned to leave several years ago, and just as I was getting ready to go, they detained my daughter out of the blue which made me very angry, and I wrote something about that and posted it online. Then they pinned a charge on me … and sent me to prison for another three and a half years. So I have been wanting to get out of China for some time now because I don’t see any likelihood that it will move towards a democratic system any time soon.